A home occupied by smokers will collect nicotine residue on the walls and other surfaces. 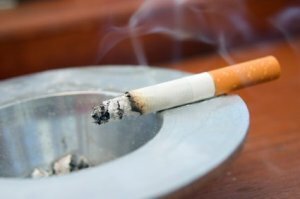 This is a guide about cleaning nicotine (cigarette smoke) off walls. We bought a cute cottage at the beach, but the walls, everything stinks of smoke. I am in the process of cleaning all the walls. I use Clorox cleaner with bleach. This is a picture of how dirty the walls are. The house was built in 1952 so we have a lot of cleaning to do. I find that TSP or TrisodiumPhosphate is great for this and the powdered form is not expensive at all. Mix it with water, and you can sponge it on with cheap mops, protecting the flooring if you need to. I'm currently cleaning an estate, and this is proof that nicotine can be washed off of the walls with vinegar, and ammonia. I didn't even use the baking soda with the concoction! Also, if you use a Scotch-Brite Dobie, it works much better than just using a rag! Happy cleaning! Ammonia is unbeatable for removing cigarette tar from walls. Since the vinegar would dilute the ammonia, I would think ammonia alone, would be best. Our apartment has been smoked in for 15 years. 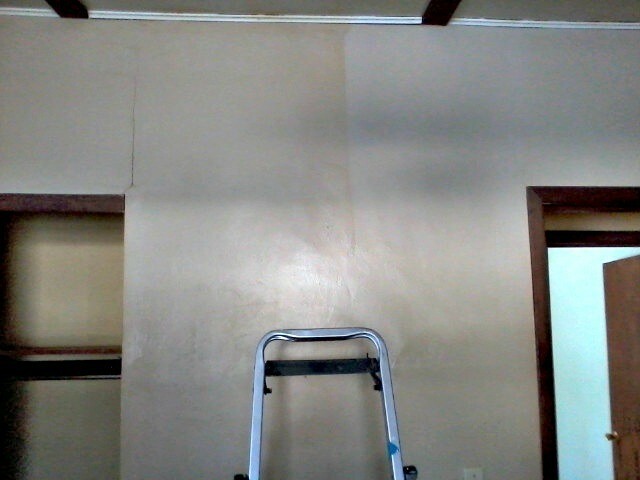 All walls were originally painted white, but now are a lovely shade of yellow/brown. We decided to stop smoking (yay us! ), so now I have begun the arduous task of cleaning walls. I've tried many of the tips here. Great tips all, however, none quite up to the challenge. Last week, I spilled some Dr. Bronner's almond castile soap on my grill. The grease disappeared completely when I wiped it off! Today, I tackled the smallest room. I put the castile soap directly on a Dobie, scrubbed the wall, wiped it with a hot damp microfiber and voila! Came. Right. Off! What is the best product to use to clean nicotine and cooking grease from walls? What are the walls made of? I did ours first with pine oil and water, using a squeezed out sponge mop. Then the last cleaning was with Murphy's oil soap. Then the very last was with Old English or Scott's Liquid gold furniture oil (I had little bits of both). The walls in the home we had at that time were 70's wood paneling, and some were painted. It worked great! TSP or Tri Sodium Phosphate is the best thing I have used, and I was a painter. It's either available in dry form to mix with water or liquid. Use a mask and goggles, as it's not good to breath it in much or splash in your eyes. Half vinegar half water will not only cut the nicotine from the walls while leaving the paint on, it will also remove the odor of the nicotine. Yes, the vinegar smell will dissipate overnight. Promise. I use a cleaner called Awesome, sold in Dollar General, Family Dollar, etc. stores. Very cheap yet very good. Use a little ammonia, a little white vinegar, a squirt of dawn dish soap, 1/4 cup of baking soda, and some hot water - at least one gallon of hot water. This takes nicotine off your walls fast and you don't have to go back over it to rinse. I have even used Easy Off Oven Cleaner in the blue can on stubborn areas on the wall. With that though, you have to work very fast because it will remove the paint right off of the wall. I used white rubbing alcohol and a handi-wipe. Because alcohol evaporates quickly that was the only cloth that worked. I completely soaked the rag no need to wring out and wiped down wall. Follow immediately with a wet towel(not one of the good one's) . The nicotine came right off. I still have the handiwipe but the towel had to be tossed. Good Luck. When my brother and sister-in-law passed away their son needed help getting the house cleaned up and ready for sale. All 3 were smokers and the walls and ceilings were completely coated. I tried many methods then stumbled on the absolute best and EASIEST way to do it. I used WINDEX window cleaner and the swiffer wetcloths. Since the cloths are used with a pole it makes doing the walls and ceilings easy. Just spray a section at a time (make sure to start at the top as the nicotine runs down the wall) and follow with the wetcloths. You do go through a lot of the cloths but I discovered later they can be wrung out and reused a couple of times before having to toss them. The windex and swiffer method took all of the nicotine off and also neutralized most of the smoke smell leaving it smelling clean and fresh. Nicotine in the wall makes us sick, with cough and sore throat. Can I clean the walls with cleaner or do I have to paint over? TSP or Tri Sodium Phosphate is the best thing you can use. It's in powder or liquid form. Best stuff you can get. How do you clean paneled walls and get cigarette smoke film off? When we moved into our first home, it had the same problem. First, get 2 really cheap sponge mops. I mopped the walls the first time with bleach and hot water, just mix according to label directions for general cleaning. After that dried, I did the same with Pine-Sol, then the same thing again with Murphy's Oil Soap. The last thing I did was rub over the walls with the 'liquid gold' types of wood preserver. Use the first mop for the bleach mixture, and the second for the Pine-sol, oil soap washes. I just used all our rags to put the Old English on the walls. If your home is like mine, it will be on the ceilings, the floors, carpets, and inside the kitchen cabinets, even inside the fridge. All of them got the same treatment. The carpets got pulled out and replaced with linoleum. For paneled walls, you could try Avon Skin So Soft. Water could discolor paneling so if you must use water solutions, do so sparingly. 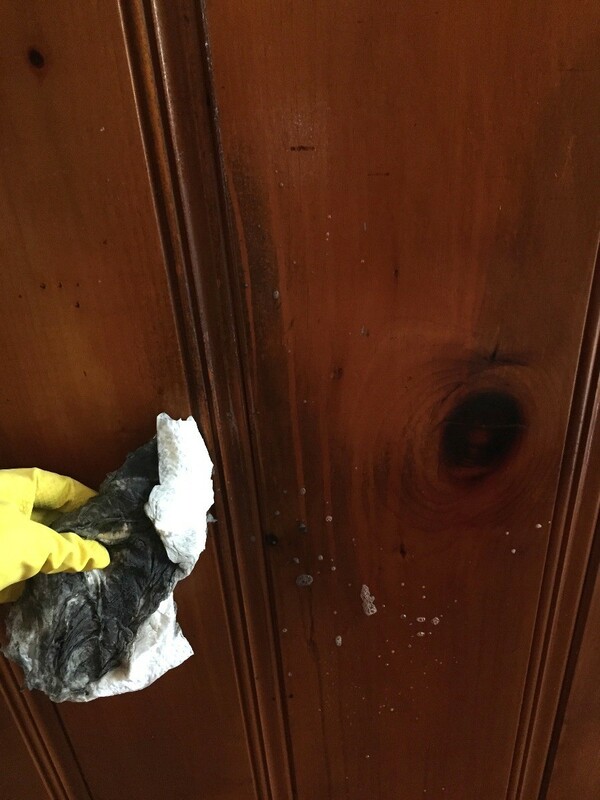 Dusting sprays such as pledge or old gold are also good for cleaning paneling as is Murphy's oil soap. Can wallpaper be covered with paint and not be effected by the underlying nicotine? Is there any undercoat that can be used? You'll need to prep the surface first by using a 1-1 ratio solution of vinegar and water - use a wrung out sponge and figure on at least three sessions of cleaning. Cleans, degreases, and deodorises, now that's win-win-win! No need to rinse, and the strong vinegar odour will dissipate within an hour or so - you may want to have a fan or open window to ventilate whilst cleaning but the fumes won't kill you if you choose to do this without ventilation. Wait at least 48 hours before trying to apply paint, more if your room is humid or cold or both. The vinegar and water wash will remove the nicotine and a good bit if not all the stain. Use Kilz or a similar product because really, Kilz is like a gold-clad guarantee, but really you shouldn't need it because the vinegar and water will remove any film and grease or other problem that might cause bleed-through. I learned this after being a smoker for years, and also as a landlady. Works a treat and I've never known it to fail. I would like some advice for getting cigarette smoke off of walls and painted woodwork. I tried using Scrubbing Bubbles on a small area of my painted work. Wow, it was amazing. It feels a little sticky. Should I wash it before painting and with what. Can you use it on varnished woodwork? Re getting the cigarette smell out-a wash with vinegar and water (half water-half vinegar) will safely clean, disinfect, and even 'prep' walls for painting, all at the same time. You may want to wash twice if there is a lot of nicotine (will show as yellow on the sponge and will turn the vinegar-water wash solution yellow too). Don't rinse, vinegar 'fragrance' will dissipate after about an hour and take the stench of the cigarettes with it. As an FYI, vinegar is a great cleaner. It kills mould safely (no potentially lung damaging chemical reaction as happens with bleach), it disinfects and deodorises incredibly well, and is just about the most inexpensive, cost effective cleaning agent around. A shallow bowl in room corners is a safe (pets won't drink it but if they do it won't hurt them) air freshener, just for one example. Now, about the Scrubbing Bubbles-did you read that part on the label about being careful when using on painted wood? :) The sticky you mention is because the cleanser in the product has 'eaten' through the surface of the paint and you will need to repaint. To repaint effectively (that is, to keep your new paint where you put it without peeling and blistering) you will need to prep your walls in accordance to what type of paint you need to paint over. If oil based paint (usually the glossy paints but not always so it's best to find out if possible), you'll need to either sand or scrape the paint off your surface, then use a primer to cover and prep surfaces that have been painted with an oil base paint. If a latex (water base) paint was used (usually flat, matte, and semi-gloss but again, not always), generally a simple wash with something that will 'rough' the surface is sufficient. You can buy (if in the US, not sure about other countries) a product called TSP that works great as a cleaner and surface prep wash for latex painted surfaces. Vinegar and water will also do the job on the flats and mattes; the semi-gloss applications are usually best prepped by the TSP wash.
How do I remove nicotine safely from dry wall without doing any damage? If it's finished dry wall, meaning it's been mudded properly and then painted, it's safe to use half water-half white vingear as a cleaning solution. Apply with a wetted and wrung sponge or soft cloth - it may take several cleanings to get the nicotine completely off. Once the sponge/cloth doesn't show any 'yellow' after a swipe, use plenty of clear water to rinse. From personal experience, this works a treat, also 'deodorises' the room as you clean.